There’s a crapload of debris orbiting our planet and potentially posing a hazard to our astronauts and our satellites. One estimate says there are 21,000 pieces of space junk larger than 10 centimetres, that could collide with other objects at velocities ten times faster than a bullet. How do we get it down? You can’t just grab any old space debris with claws, and even if you could, grippers can be unwieldily. So a team of scientists thought, what about sticky stuff? But even sticky stuff can pose a problem, since chemical adhesives might not work in the vacuum and temperature of space, according to a paper published yesterday in Science Robotics. A team of Stanford and NASA researchers think they’ve solved the problem with just the right sticking agent, and it’s based on gecko feet. Scientists aren’t strangers to the gecko’s sticky foot. We’ve written about how gecko feet could help clean your apartment, climb walls, or even serve as a strapless bra. The secret is in the van der Waals forces between atoms. Atoms are positively-charged cores with negative electrons orbiting them, but the random motion could leave an uneven distribution of the negative charge. Areas of extra negative charge can temporarily attract to areas of exposed positive charge on other atoms, leading to adhesion. The key is then to use these forces to make stickies. Sticking in space has a few added challenges, though. Any extra force might send an object floating away. And certain properties of adhesive devices make them difficult to scale—simply making their area bigger means they’re more likely to unstick due to individual failures, according to the paper. That lead the researchers to come up with their sticky gripper devices. Essentially, the gripper divides a gecko-inspired adhesive into smaller gripping tiles, so if one of the tiles fail the whole piece of debris doesn’t unstick. It attaches softly with springs and pulleys, conforming to the shape of the debris to stick without delivering too much of a push. And when the researchers tested their adhesive in a zero-gravity plane on things as big as 370 kilograms it seemed to work quite well. 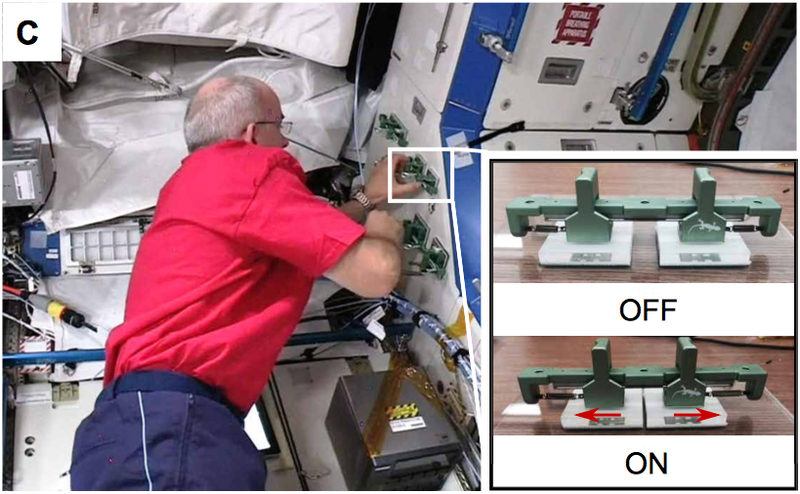 They even tested it on board the International Space Station. The sticker is mainly for large, smooth pieces debris, according to the paper—it could have trouble sticking to rough surfaces, and in some cases it’s not as strong as mechanical grippers, making these the big challenges to overcome. And there’s no word as to how this would actually be deployed on a debris-gathering mission. One researcher, Emre Kizilkan from the Zoological Institute at Kiel University in Germany who produced another gecko-inspired adhesive, commented that these adhesives can be quite expensive, and this gripper uses a lot of it—which actually makes it a good choice for space. “For space applications, the production cost of such dry adhesive surfaces can be tolerated,” he told Gizmodo in an email.